You’d be replacing forklift brake shoes every day if you strictly followed the advice to replace worn parts, so there is something to be said for replacing them only after they are worn to the degree they can be considered a hazard. But what is an acceptable degree of wear? Imagine the consequences if you stepped out on to the street and the driver of a speeding car slammed on his brakes to avoid hitting you, but his worn brakes caused his vehicle to slow only to 20mph before impact. That’s exactly the kind of force a 10,000 lb forklift carrying 4,000 pounds of materials exerts when traveling at only 10mph. Even with maximum stopping power, it takes a forklift approximately 1.3 feet per mph to stop. That’s why recommended forklift speed limits are so low. A worn or defective braking system can double this stopping distance or even more. When forklift parts in a braking system wear out to the degree that they affect stopping times, they should either be replaced or the operator should slow down to compensate for their degree of wear. Forklift safety experts say that the maximum speed a forklift should be driven is 8mph. Needless to say, slowing down to 4mph is going to have a significant impact on productivity, but a forklift accident is going to have an even more serious impact and can lead to heavy fines and have costly legal implications. Another forklift part that can seriously affect forklift performance and safety is the leaf chain. An almost impossible part to inspect, the leaf chain must support the entire weight of the load the forklifts are carrying. If you have older forklifts in your fleet, consider replacing their chains. ISO regulations were not as stringent in the past as they are today, and the danger is compounded by the age of the equipment and the stress placed on the chain over time. 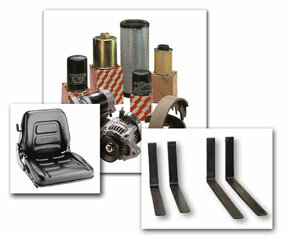 What about those worn forklift parts that don’t seem to pose a safety hazard? When a prominent pallet manufacturer was looking for ways to improve productivity in their facility, they discovered that all the leaking hydraulic fluid that was collecting on their floor was having a negative effect on productivity. After initiating a clean up program that included fixing hydraulic fuel leaks and regularly sweeping the floors, productivity increased to the point where it significantly reduced the cost of producing pallets. By taking these simple, inexpensive steps, the company increased profits without increasing prices. OSHA requires daily lift truck inspections, but has found that even companies that do perform daily inspections often don’t replace or repair worn forklift parts. There are various reasons for this, but the bottom line is that a forklift inspection is useless if you don’t follow up with maintenance and repair. When you consider that a well-maintained forklift is a safer and more productive forklift, is there any reason not to order forklift parts from forkliftaccessories.com when you need them?